The 22-year-old local boxing sensation headlines an eight-fight card at 2300 Area on Feb. 8. You could call him the real-life Rocky. But, unlike Balboa, this TKO Italian triumph has his roots in South Philly. For the past few years, 22-year-old bantamweight Christian Carto has risen the ranks of local boxing rings, collecting a professional record of 17–0 with 11 by knockouts. Claiming victory in every single one of his pro fights since 2016, Carto, who descends from a lineage of professionals in the game, proves himself as one of the most unparalleled boxers to surface from South Philly in recent years. On Feb. 8, the undefeated prospect will face off on his own turf as he braves Mexican southpaw Victor Ruiz at 2300 Arena, 2300 S. Swanson St. 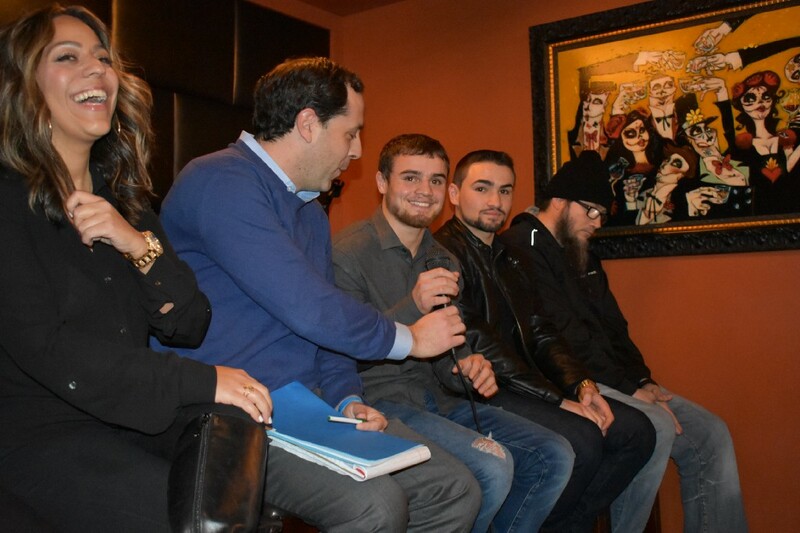 Deemed as the “Philly Special” by local boxing promotion Raging Babe, Carto recently stopped by Chick’s bar and grill, 1807 Washington Ave., where he discussed the upcoming match alongside his dream team, including hall of fame boxing promoter J. Russell Peltz, manager and brother Frankie Carto Jr., lead trainer Billy Briscoe and Raging Babe CEO Michelle Rosado. Growing up, Carto, who balances punches in the ring with courses at Rowan College at Gloucester County, caught the pro boxing bug from his two great-uncles and grandfather, Frankie Carto, who matched up against world champions and even fought once at Madison Square Garden in the lighter weight divisions during the 1930s and 1940s. However, Christian Carto not only has his family’s name to carry, but the legacy of South Philly Italian boxing, as the young athlete draws parallels to the revered mid-1960s world middleweight champion Joey Giardello, who resided in the East Passyunk Crossing neighborhood. Carto has even been compared to the lineal and World Boxing Association bantamweight champion “Joltin’ ” Jeff Chandler of the 1980s, Chandler was the last world champion to call South Philly home. In the eyes of the local boxing community, Carto shows promise to resurrect the presence and popularity of the sport in Philadelphia. As far as Carto handling this kind of pressure? He says doesn’t think about it too often. “I’m just hoping to leave my mark as a real good fighter in the bantamweight division from Philly,” he said. For now, though, Carto is pouring his practice into February’s “Philly Special” card. The 28-year-old Ruiz is considered a veteran of the super flyweight division. In 2015, the southpaw defeated International Boxing Federation world super flyweight champion Daiki Kameda from Japan. Coupled with this challenge, Carto’s coming back from a recent streak of no knockouts. Every day, Carto has been vigorously training with Briscoe, working on movements, techniques and punches to counter the swings of a southpaw. But, Briscoe says, knockout or not, Carto’s certain zeal gives him a natural advantage. Win, lose or draw, the college student will pour all of his hits and all of his heart into the eight-round event, striving to make South Philly proud. “You can expect a good exciting fight from me come Feb. 8,” Carto said. Info: Tickets are priced $50, $75 and $125. They can be purchased online at www.2300arena.com or by calling (215) 765–0922.